﻿ News Bharati - ‘Ek call desh ke naam’ an international campaign supporting the Indian reigns..! News Bharati - ‘Ek call desh ke naam’ an international campaign supporting the Indian reigns..! ‘Ek call desh ke naam’ an international campaign supporting the Indian reigns..! New Delhi, February 9: Staying abroad, caring for the motherland and paving their way back to the roots in India, the Non Residing Indians have come up with a novel international campaign named ‘Ek call desh ke naam’, supporting the government amid the upcoming LokSabha elections, with a hope of India’s reach to new altitudes. 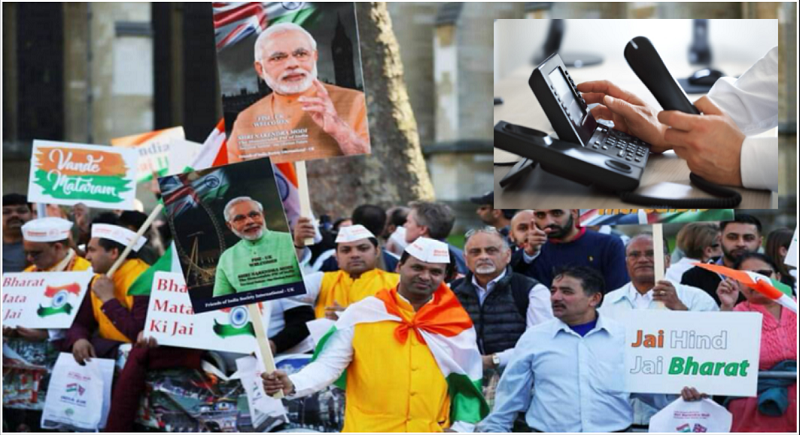 The campaign initiated by ‘Friends of India Society International UK (FISI-UK)’ is set for motivating the NRIs, connect to the Indian masses using the social media platforms. “In a world of trends being set by narratives in social media, NRIs would like to set the trend of positivity of the immense work done. For the sake of India, BJP should be back in 2019 Lok Sabha elections with a much larger majority than 2014 and that is our call of the hour”, claims Santosh Gupta, Assistant General Secretary to the organisation. Today, the world is seeing a new India emerge under the leadership of Narendra Modi. The 2019 Lok Sabha elections is a turning point wherein the nation has the opportunity to re-elect BJP for a second term. Modi had come with a thumping majority in 2014 promising “Sabka Saath Sabka Vikaas” and his efforts towards this promise have led to the first phase of ground breaking work. The areas of infrastructure, removal of corruption, poverty alleviation, stronger economy, strengthened home land security and armed forces are all the outcomes monitored and accomplished. Adding to the robust urge further, Gupta said that NRIs feel indebted to their country and would like to do their bit to convey their message of trust with BJP government led by the Prime Minister. “It’s a call to Indians living worldwide to help fellow Indians back home see reasons on why BJP should be back in power in 2019”, he added. “Teams are being formed worldwide in support of this international campaign. The idea is to devise innovative ways of spreading the message and connecting with Indian masses using social media platforms. This includes making short videos, recording live events in world’s premiere cities and more. It is going to be a platform for people living abroad to be a part of the 2019 Lok Sabha election season and express themselves creatively on why Modiji”, informed one of the crusader meanwhile. A changing India has also inspired millions of Indians living worldwide. They feel more connected and proud of their origins. Modi’s display of honesty, strength and ability has ignited a hope in them for a better India. In addition, the extant PM has raised the profile of India globally through his strengthened approach whether it be dealing with our belligerent neighbours or guarding our interests believing further that India needs this continuity in 2019 reaching newer heights.